Tunisians Embrace Life Without Censorship During Zine El Abidine Ben Ali's 23-year rule, the press in Tunisia was censored. That changed literally overnight last Friday when he and his wife fled the country. Now, books that were once banned are appearing in bookstores, Tunisians don't have to turn to foreign channels for news, and a scathing ballad about the former president fills the airwaves. 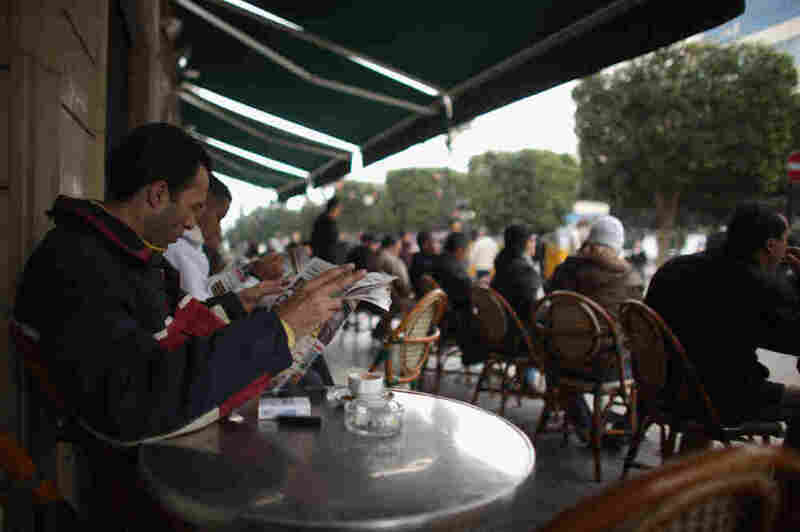 A Tunisian man reads a newspaper at a cafe in Tunis on Thursday. The press was censored during Zine El Abidine Ben Ali's 23-year rule. That changed overnight last Friday when he and his wife fled the country. During Zine El Abidine Ben Ali's 23-year rule, the press in Tunisia was censored. That changed literally overnight last Friday when he and his wife fled the country, ending his dictatorship. A week ago, as tens of thousands of people protested in the streets of downtown Tunis demanding that Ben Ali leave, the country's national television played Islamic chants while showing verses of the Quran. That surprised no one, says 22-year-old student Mehdi Hachani. "Young people are angry when they watch Tunisian TV," he says. "They don't see what they are seeing in the street." Hachani says Tunisians watched French and Arabic cable stations to get their news. His mother, Mufida Hachani, has spent most of her career as an editor at Tunisian state television. She says the channel did not have the courage to broadcast footage of the protesters and police violence at first. But after Ben Ali fled the country, the station took on-air calls from angry Tunisians for the first time in its history. "I'm 56 years old, and I have been fighting for all this time," she says. "Never, we have never been free to run our stories. It's a victory. But I hope it will be a victory for a long time, because they are still there and really, we are afraid." Afraid, Hachani says, of the editors from the Ben Ali regime who are still in place. But today, the family can sit together and watch a real, uncensored news broadcast for the first time on Tunisian television. 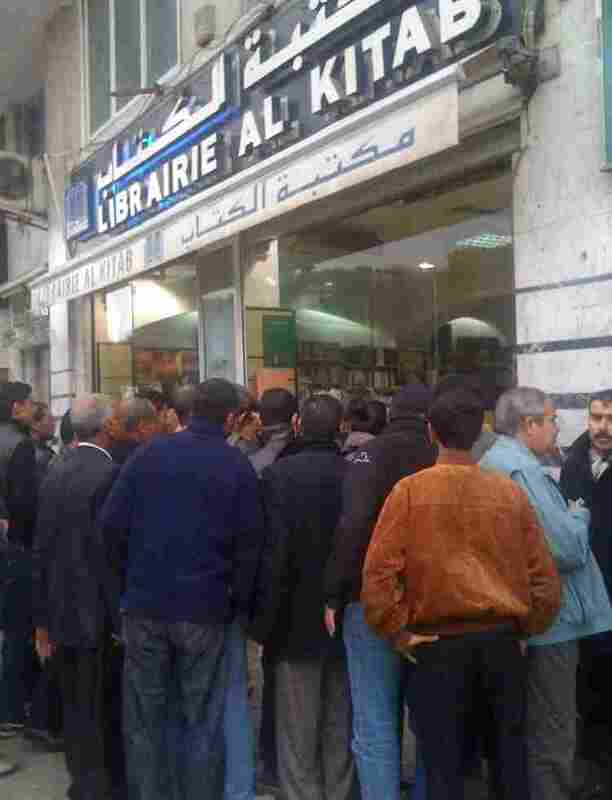 A crowd looks through the window of a Tunis bookstore at books that were previously banned. There have been dramatic changes all over Tunisia since the Internet filter came down and the Information Ministry was abolished. Newspapers that had been forced to put an official photo of the president on their front pages every day were instead printing salacious details of the presidential couple's personal life. Outside a bookstore on Habib Bourghiba Avenue, a crowd looks through the window at a display of books that were all banned just a week ago. Before the government fell last Friday, the owner, Selma Jabbes, spoke about the difficulty of importing foreign literature. Today, she's beaming as she welcomes customers into her store. "We have all the books that were forbidden," she says. "It's books about the families of Ben Ali, and all books about freedom and liberty of thinking." Customer Zeid Hafhouf says he's finally able to get a book written by two French journalists called The Regent of Carthage. It's about Ben Ali's wife, Leila Trabelsi, who is a hated figure in Tunisia. He says everyone has been dying to read it. "I'm very happy. It gives me a good reason to stay in my country," he says. "Before, I was planning to leave, because I said to myself I could not live in such a country where I cannot be free to read what I want." Not far from the bookstore, journalists are in an editorial meeting at Radio Mosaique, one of Tunisia's private stations. While Radio Mosaique pushed the envelope of what was permitted under Ben Ali's rule, many station employees say they lived in fear. Disc jockey Alaeddine Ben Amor said he was not really able to choose his own music. "We had ... some songs that we had to broadcast." Like the songs of Latifa Arfaoui, who was a close friend of the president. Ben Amor says he's deleted all of her songs. Now, he says, he's finally enjoying his freedom and his job. His new favorite artist is rapper El General, who was just released from prison. Ben Amor puts on El General's scathing ballad about Ben Ali, entitled "Mr. President." "If I played that before, I'd be in jail," he says. "That's it."